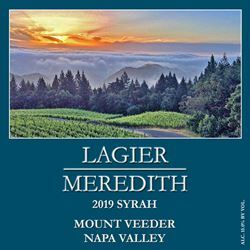 Producing less than 1000 cases a year, Lagier Meredith Vineyard is a small mountain vineyard planted to Syrah, Mondeuse, Malbec and Zinfandel. Husband and wife Stephen Lagier and Carole Meredith bought the land in 1986 and planted the first vines in 1994. They live on the property and do the vineyard work and winemaking themselves. Shallow soil of fractured shale and sandstone restrains the growth of the vines, keeping them naturally balanced. The wine’s deep color and concentrated flavor come from the shallow soil, which keeps the berries unusually small. Bathed in cool air from the nearby bay, the vineyard yields distinctive wine of remarkable complexity.